Durango Silver Co has been producing hand crafted Designer Silver Jewelry for nearly 40 years in Durango, Colorado USA, all of our Designer Silver Jewelry is made in the USA. We produce Quality Designer Silver Jewelry here in Durango and we handle high Quality Designer Native American Silver Jewelry that is hand crafted in our local area as well. The standard of our Silver Jewelry is above and way beyond most hand crafted Silver Jewelry that you will find in the marketplace. Our Designer Silver Turquoise Jewelry is our specialty and we are known for producing some of America's best as we have mined and collected high grade natural Turquoise for over 40 years. This is a beautiful piece of Designer Silver Jewelry - Hand Crafted Silver with genuine American Turquoise, Sugilite, Spiny Oyster Shell and Gaspeite. Exceptional quality Hand Crafted Silver Jewelry, such as this example, is what our company has been producing for decades - our Designer Silver Jewelry has real value today and will become valuable American heirlooms in the years to come. We invite you to browse through our Online Store to find many unique and very special pieces of some of the best Hand Crafted Designer Silver Jewelry Southwestern America has to offer. Below are a few different examples of Designer Silver Jewelry along with descriptions. We have many great educational presentations on Silver Jewelry that will help you learn more about the Jewelry that we handle and produce - see our Silver Jewelry Learning Center. Above and to the left is a pair of Designer Trillion Cut Sugilite and Trapezoid Cut Rhodocrosite Sterling Silver Stud Earrings by John Hartman. 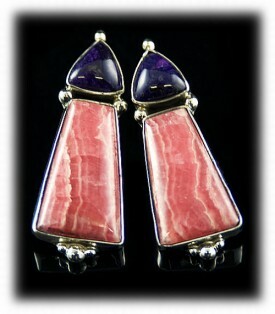 These earrings are designed simply to show off the beautiful highgrade stone that they feature, beautiful banded Natural Rhodocrosite and Natural deep purple Sugilite. Durango Silver Company tries to always have a good selection of Designer Silver Jewelry with outstanding and colorful gemstones. To the upper right is a Designer Silver Ring with gold accents and a high quality Blue Wind Spiderweb Turquoise gemstone from Nevada. 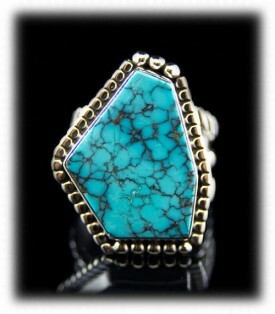 This is a very large and bold Ring that really stands out when worn. The entire Rings has unique accents including a hand stamped Ring shank. We enjoy designing unique and unusual pieces that are not normally seen elsewhere, we love to make Jewelry that has the WOW! factor. Above and to the left is a beautifully inlaid designer Silver bracelet hand crafted by Edison Yazzi, Navajo. This piece of Designer Silver Jewelry features orange Spiny Oyster Shell, Black Jade and Sleeping Beauty Turquoise in a multi color inlay bracelet. These vibrant Spiny Oyster stones are accented with natural Black Jade and “Robin’s Egg” Blue Sleeping Beauty Turquoise which makes this piece of Jewelry extremely attractive. This bracelet is 100% Native American handmade. 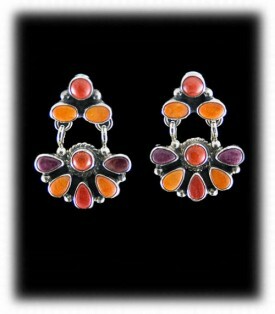 Edison is a great artist and produces high color inlaid designer silver jewelry like nobody else. 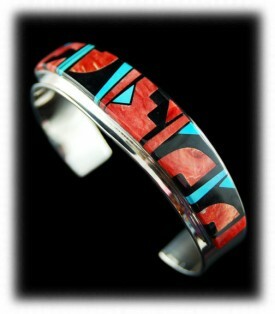 To the right is a lime green Carico Lake Turquoise Inlay Bracelet by Native American artist Phil Loretto. This Carico Lake Turquoise bracelet is museum quality. It is certainly a quality piece of quality designer Silver Jewelry which bracelet features 18 rectangular, top gem grade, lime green, Carico Lake Turquoise inlaid stones. Again, The Turquoise stones are set into a beautiful, one-of-a-kind, Sterling Silver Cuff Bracelet. This is a heavy weight bracelet with deep recesses in a large size that would be for a gentleman. We appreciate Phil's work and always try to have as many of his pieces on hand as possible. 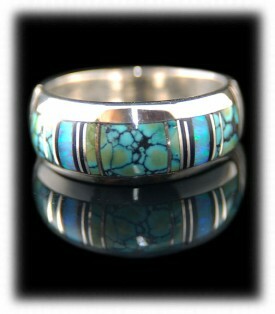 Above and to the left is a mens Turquoise Inlaid Ring by Steve Harper. It features beautiful spider web Tibetan Turquoise inlaid into a men’s silver band ring. 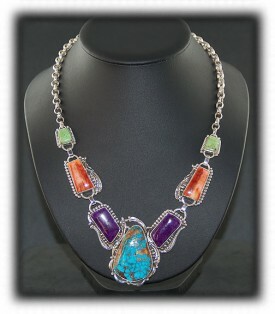 The spider web Tibetan Turquoise is accented by Fire Opal and Black Onyx. This designer Silver Ring is very low profile and extremely comfortable. We try to have as many of these low profile mens rings on hand as possible as they are very comfortable and men like a ring that is streamline. To the right is a pair of Navajo Cluster Earrings with multi color gemstones - Spiny Oyster Shell in all of its color ranges. They are Native American hand crafted by Navajo Artist Geneva Apachito. The stones are surrounded by rope and raindrop designs and dangle from a top cluster piece. This style of designer silver earrings are very attractive when worn and they are also light weight which we are always concerned about for our customers. Durango Silver Company has a wide variety of Silver Jewelry and based on your lifestyle we feel we have a lot of Designer Silver Jewelry as well. 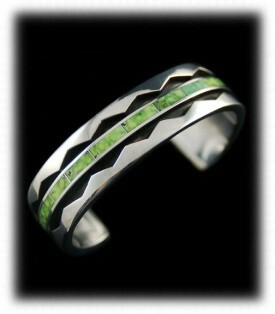 Our 925 Silver jewelry is all 100% hand crafted. We invite you to take a look at a few of our other presentations - Gemstone Silver Jewelry, Turquoise Beaded Jewelry and our Silver Jewelry Videos page. We invite you to learn more about Designer Silver Jewelry and American Silver Jewelry by following the links in our Learning Center to other informational pages we have written on different topics directly related to Designer Silver Jewelry. In addition, we would like to invite you to join our E-Mail Newsletter - about once every other month we send out a Newsletter to inform our members of what's happening with Durango Silver Company, new products, specials for our members and more. We also have a monthly drawing from our member base to give away free Turquoise Jewelry from our company. Please take a moment to become one of our friends by signing in below. We hope you have enjoyed our presentation on Designer Silver Jewelry and have gained some useful knowledge from it. We Thank You for taking your time it view our presentation and we hope you will remember Durango Silver Co the next time you are considering Designer Silver Jewelry.